Prof. Charitha Pattiaratchi holds Bachelors, Masters and PhD degrees from the University of Wales, UK. He has been at the University of Western Australia for 30 years and currently holds the position Professor of Coastal Oceanography. 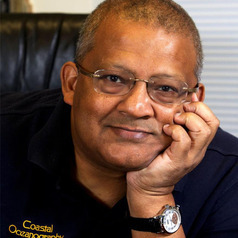 Prof. Pattiaratchi has supervised over 30 PhD students and 100 honours students and has published over 300 articles/reports on coastal oceanography, which include over 150 in peer-reviewed international journals. He has received more than $ 28million in research funding. Prof. Pattiaratchi's research interests are in coastal physical oceanography and coastal sediment transport, with emphasis on field experiments and numerical modelling. He has played an active role in examining climate change effects in coastal regions of Western Australia and particularly in terms ocean currents, wind and wave climate, sea level variability, coastal flooding and beach stability.